What does a former Taoiseach do in his spare time? Head east. At the invitation of the Chinese People’s Institute of Foreign Affairs(CPIFA),Mr. Bertie Ahern, former Prime Minister of Ireland, visited China from 26 to 30 April. 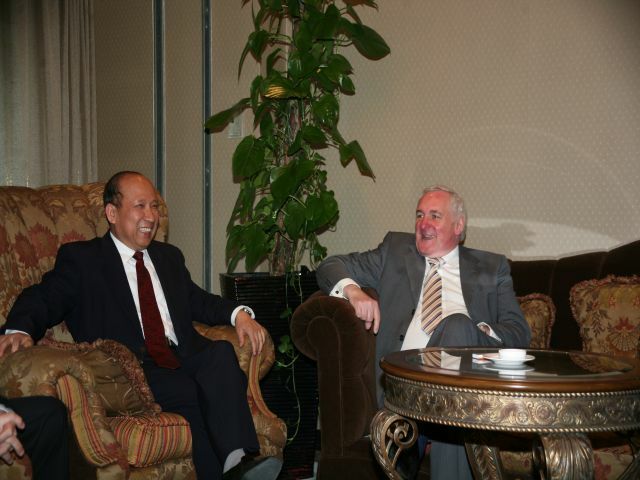 Ambassador Cheng Tao, Vice President of CPIFA, Mr. Loujiwei, Board Chairman of China Investment Corp.,met with Mr. Ahern. The two sides exchanged views on international hot issues, economic and investment cooperation between China and Ireland. Mr. Ahern also visited Anhui Where he met with Mr. Zhang Baoshun, Secretary of CPC Anhui Provincial Committee and Mr. Sun Jinlong, Secretary of CPC Hefei Municipal Committee. How much did that cost? Well now he’s no longer a member of the Oireachtas we won’t know and we won’t know how much he was paid. We know that he’s not seeking a presidential nomination, well Micheál Martin won’t be giving him one anytime soon! Bertie’s previous trip to China involved hawking our forests or exploring the possibility on an all expenses paid trip.